Pastebot has various settings to help conform around your workflow. You can access it by going to the Pastebot main menu and choosing Preferences. The General tab contains visual customization options for the quick paste menu. 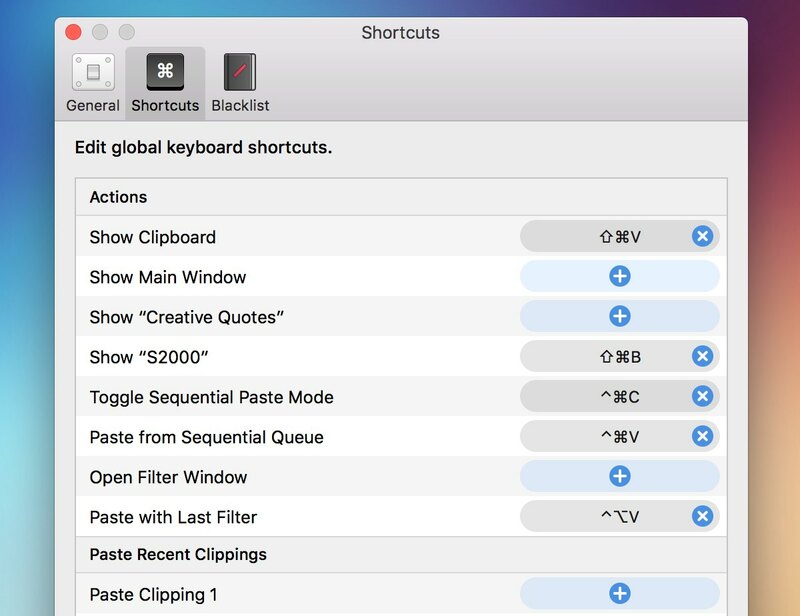 Pastebot’s keyboard shortcuts can speed up pasting tasks immensely if you bring them into your workflow. By default only one shortcut is enabled by default (Show Clipboard). If you create custom pasteboards, you will be able to add shortcuts to this menu to call them up quickly. “Toggle Sequential Paste Mode” toggles sequential paste mode where you can create a queue of copies to paste in sequence. “Paste from Sequential Queue” pastes from your queue. The “Open Filter Window” shortcut lets you quickly pick a filter to apply to the current item on your clipboard. “Paste with Last Filter” allows you to quickly paste the current clipboard item while automatically applying the last used filter. The “Paste Recent Clippings” section allows you to assign a shortcut to the 10 most recent clipping orders. This allows you to quickly paste a recent previous clipping or paste in sequence by repeatedly hitting the same shortcut key. The blacklist keeps specific apps from being accessed by Pastebot. By default your OS Keychain is automatically blacklisted. Applications that properly mark sensitive clippings as transient data also do not show up in Pastebot. So applications like 1Password are already blacklisted even if you don’t see them in the list. However for your own peace of mind, you can still add them. You can use the blacklist for more than just sensitive data. There may be an app that you copy from often, but don’t want that clipping data stored in Pastebot because it may not be usable elsewhere. Like when working in a music or video production application.